Hitachi announced the world's first Blu-ray Disc (BD) Camcorder, which records one hour of 1920x1080 Full High-Definition video onto a BD (single side, single layer). The new camcorders will start selling in Japan on August 30, 2007, and overseas market sequentially starting from October. The new BD camcorders have a system which captures, records and stores 1920x1080 full high-definition video throughout the whole process with its newly developed full high-definition lens, 5.3 mega pixel progressive CMOS (Complementary Metal Oxide Semiconductor) image sensor with effective 2.07 mega pixels for video and 4.32 mega pixels for still photo, the newly developed full high definition signal processor "Picture Master Full HD," and the world's first 8cm BD drive, which can record 1920x1080 full high definition video on a 8cm BD. A 8cm BD has 5 times more capacity than a 8cm DVD. 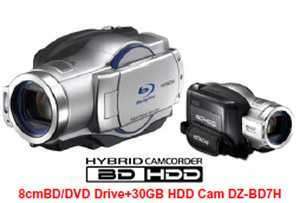 Non-tape media camcorders such as DVD and HDD camcorders have grown to dominate more than 80% of the camcorder market. High definition camcorders have taken more than 30% of the consumer camcorder market, and are expected to continue growing. In 2000, Hitachi introduced the world's first DVD camcorder, and in 2006, the world's first hybrid camcorder with a DVD drive and an HDD drive, which makes it easy to dub the contents on the HDD to the DVD.